Climate change is having real, wide-ranging effects now on national parks around the country. Persistent high temperatures could kill the namesake trees at Sequoia National Park. Photo © Sasha Buzko/iStockphoto. The giant trees that give Sequoia National Park its name are some of the largest and longest-lived organisms in the world, reaching their exceptional stature after persevering for thousands of years within a limited range in California's Sierra Nevada Mountains. It’s difficult to look up at this kind of grandeur and imagine the sequoia as a fragile, threatened species—but like the glaciers in Glacier National Park and the pikas in the American West, these massive trees are suffering from the prolonged effects of climate change. Last month, the National Park Service released a report confirming what many park visitors have already observed—that climate change is making national parks around the country hotter than normal, for longer periods of time, with extreme spikes in temperature. Two of the agency’s scientists, William B. Monahan and Nicholas A. Fisichelli, analyzed climate data at 289 different national park sites from the last three decades and compared the information with historic data dating back to 1901. They found a host of climate-related problems in the National Park System, including waterways drying up, endangered wildlife struggling to survive, fire and other landscape changes threatening forests and the structural integrity of buildings and bridges, beaches eroding, and flooding that could someday put irreplaceable natural and cultural resources underwater. The results of the study magnify the impacts of climate change and are hardly a surprise; they also serve as a powerful reason to continue to reduce the air pollutants that are degrading our parks and changing the climate. 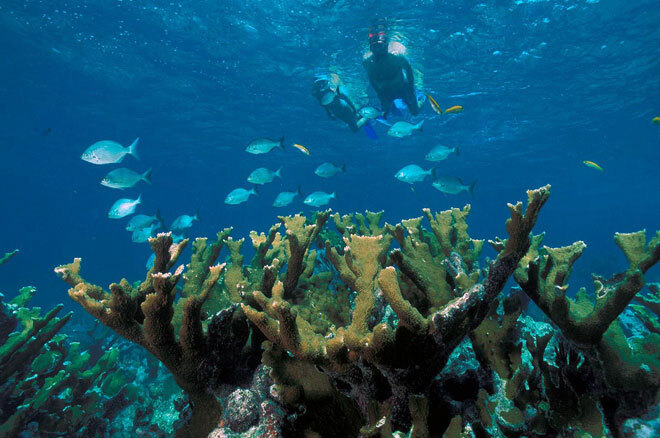 Warmer temperatures alter ocean chemistry, weakening the health of sensitive corals at Biscayne National Park in Florida and threatening their survival. NPS photo by John Brooks. Set stronger targets. The 2030 goal could be accomplished by 2020—global warming isn’t slowing down and neither should our efforts to fight it. Make sure state plans reduce both air and climate pollution. Ensure plans for power plant cleanup restore national park air and meet carbon standards. Include coal plants on tribal lands. The current plan excludes some of the country’s dirtiest coal plants and biggest park polluters, including some owned by the federal government, because those facilities are on tribal land. Fortunately, NPCA and its supporters have been leading the charge to improve air quality at national parks and reduce climate-warming pollutants for decades—and will continue to push for rigorous pollution standards regardless of the outcome of the president’s plan. 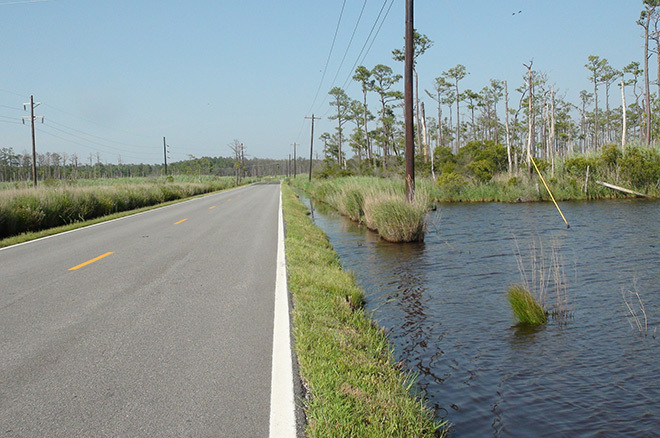 Rising waters threaten to overtake a roadway at Harriet Tubman Underground Railroad National Monument in Maryland. Photo © Jessie Turner/NPCA. Under the Clean Air Act, Congress mandated that iconic, sizeable national parks, like Grand Canyon and the Great Smokies, must have the best, clearest air quality in the country. Through this decades-old law, NPCA and its supporters have pursued strong pollution controls for coal plants, resulting in 93 plans to clean up or retire antiquated facilities, clearing the air in our national parks while also taking millions of tons of carbon dioxide out of the atmosphere. One of NPCA’s greatest successes is at Great Smoky Mountains National Park. In 2011, NPCA helped broker a historic agreement with the country’s largest power utility, Tennessee Valley Authority (TVA), to retrofit or retire 54 of its 59 coal-fired electric generating plants. Air is measurably cleaner in the Great Smoky Mountains as a result. NPCA and its advocates have also helped close three coal-fired electric generating plants at the Four Corners power plant near Mesa Verde National Park in Colorado and two at the Centralia power plant near Mount Rainier National Park in Washington State. In New York, NPCA’s advocacy contributed to the planned cessation of coal burning at the Danskammer electricity plant, which will result in improved air quality at Acadia and throughout the Northeast. Grand Canyon National Park, Arizona. This desert gem has already endured 13 years of drought, and rising temperatures make water sources even scarcer, threatening the survival of area wildlife. Biscayne National Park, Florida. Corals are dying due to increased heat and disease. Yellowstone National Park, Wyoming, Montana, Idaho. Rising temperatures are enabling insect pests to survive the winter and kill whitebark pine trees that grizzly bears need to survive. Harriet Tubman Underground Railroad National Monument, Maryland. The 25,000 acres in this relatively new park site still look much the same as they did in Tubman’s time, when she risked her life to bring enslaved Americans to freedom—but rising water levels threaten the park’s ecology and historic sites. Sequoia National Park, California. Persistent high temperatures could kill the park’s namesake giant sequoia trees while increasing forest fire risks. Bandelier National Monument, New Mexico. Increased wildfires, soil erosion, and flash flooding threaten the monument’s ruins, which tell the story of over 10,000 years of Ancestral Puebloan and Spanish history. Historic Jamestowne in Colonial National Historical Park, Virginia. Many important archeological sites are being lost to coastal erosion and rising sea levelsin this park established to protect some of our earliest American colonial history. Everglades National Park, Florida. Rising sea levels are inundating the freshwater habitats that are home to rare tropical orchids and herbs, pine forests, and many species of wildlife. Please join NPCA in asking EPA Administrator Gina McCarthy to finalize President Obama’s climate plan to make it even better for parks and people. You can also learn more about what the Park Service is doing to combat climate change on the ground.